All Dr Stuart's teas are created by a leading ethnobotanist Dr Malcolm Stuart, who is described as 'the father of modern herbalism'. This is the only brand to use active botanicals, which are from the most prized parts of the plants, ensuring that the herbs used are very clean, fresh and high in the essential oils that make Dr Stuart's Teas extraordinary. Only pure natural ingredients are used with no additives or artificial flavourings or colourings. The range covers teas for many different days and moods and each has its own unique benefits. 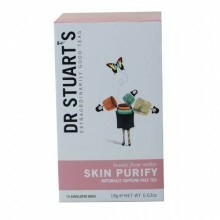 Click the button below to add the Dr Stuart Skin Purify Tea 15 bags to your wish list.